View More In Emergency & Survival Kits. Laida & Thread Personal Alarm -- For Your 24 Hours Close Protection ! Laida & Thread Emergency Alarm is very useful for everybody, especially for women, girls, kids, night walkers and adventurers who is in dangerous situations. Its super loud siren sound would deter the attackers or intruders instantly and force them to give up on attacking. Quickly draw enough attention of people in a wide area for efficient help. ※ Mini led flashlight is quite useful for finding a keyhole in the dark or dark area illumination. ※ Wide versatility: school bullying, anti-theft, elderly rescue and outdoor adventures. ※ Great handbag or keychain accessories with its small and handy shape, looks like a backpack or a key ring decoration. ※ The metal pin of ripcord is never too loose, which is good as you might not inadvertently set it off unintentionally. ※ Easy replace the batteries by opening the back cover with a screw driver and always keep it in a dry and cool place for long term use. ※ Always backed by our No Hassle Return and 30-Day Money Back Guarantee. Please feel free to contact us anytime. 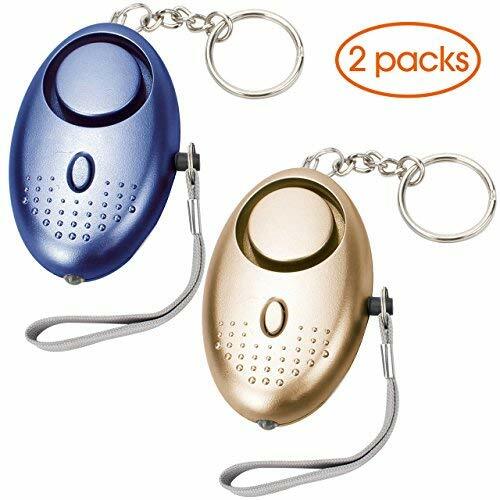 Laida & Thread Emergency Personal Alarm is a MUST BUY for personal safety! 1.The siren sound of our alarm is very loud, please do not put it by your ears. 2.Please replace the batteries immediately when the sound is getting weak. 3.Please avoid our alarm being handled by infants or children under 6 yrs old. If you have any questions about this product by Laida & Thread, contact us by completing and submitting the form below. If you are looking for a specif part number, please include it with your message.